Here. Forward. 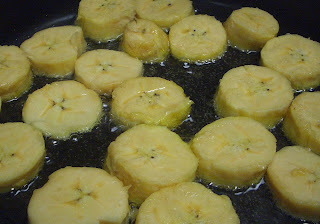 : Let's fry some plantains! Two weeks ago I bought some plantains for a class demonstration. They sat on the counter in my classroom for several weeks to ripen. It was the perfect opportunity to talk about this fruit and the different ways to prepare them. If you prepare them "green" it is a bland/starchy food much like a potato. And as you probably already know starch turns to sugar (yum) as they ripen. The ones above are about a day or two blacker than I usually prepare them but we were unable to use the kitchen before yesterday. We talked about the difference between a banana and a plantain. Do you know the difference? Peeling them can be somewhat of a problem. The peel does not always come away cleanly. I was so busy helping my students that I didn't get a picture. 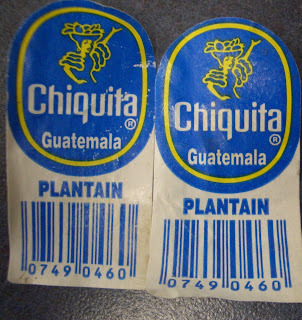 Growing up with a Jamaican background, my mother always cut them in small pieces. 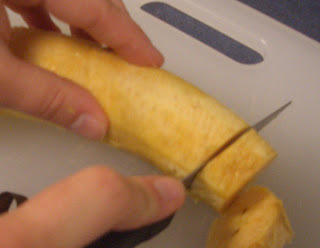 During my two visits to Costa Rica I noticed that some people cut them lengthwise. We fried them in olive oil. These are ready to eat. All but one of my 8 students liked them. They were thrilled to share the experience with others and asked if they could deliver them to other classrooms. I was shocked as to how many adults (other teachers) refused to taste them or turned their nose up. If you have never had one they have a slight banana/ sweet potato taste. I don't know...you would have to try them and find out what you are missing! Would you? Could you...eat them? yum...maybe with a little cinnamon as well? i would eat them here or there, i would eat them, will you share? 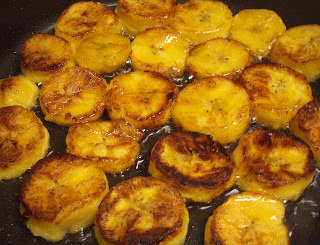 I have never tried plantains but they certainly look tasty. I will have to give them a try. Def. something I'm going to have to try! Just popping in from SITS, hope you have a great long weekend! I LOVE these! Yummy! When I had them, Mexican style, they sprinkled cinamon sugar on them. SOOOO yummy! They look good to me! Use them as a side vegetable? They look yummy! I've never tried them before. But thanks for the info. And thanks for stopping by my blog too! What's wrong with these pants?